How many of the respondents actually saw your branding and how many just glanced at it? Now CoolTool provides you with one more great indicator to get better consumer insights from your eye tracking tests - "Glance participants count". What is Glance Participants Count? The Glance participants count indicator demonstrates the number of unique respondents who not only fixed their gaze on the particular AOI but also took a look at the object without setting their sight on it (experienced saccadic eye movements). This metric shows the total number of respondents who skimmed over the object, however briefly. The Glance participants count indicator allows you to get more consumer insights by detecting absolutely all glances made by respondents at particular Areas of Interest. 1. Branding elements. For example, the report demonstrates that none of the respondents fixed their eyes at the logo on the booklet, but at the same time survey results confirm that the majority of respondents recognized and remembered the logo, as well as managed to name the brand. Now, if you consult the report you’ll be able to observe the saccadic eye movements: respondents glanced at the logo (without fixating their eyes on it) which was sufficient for them to remember it. 2. Images (special offers, promos). Respondents may ignore the item, which they received as a bonus. They might remember or they might forget what you distributed as a giveaway. If you observe that respondents experience saccadic eye movements but don’t set their eyes on the product itself, it means that the image (offer) didn’t attract the expected attention and is not appealing to the target audience. It may also mean that respondents saw the image as not engaging and not worth considering. 3. Any elements of packaging. A logo, a brand’s name, an image, a user manual – any area of your product packaging can be tested. Now you can learn whether the respondent glanced at these elements or they went by unnoticed. If respondents didn’t look at the particular packaging element at all (neither fixation of eyes nor glance participants count was registered), it means that the element’s location is inappropriate. In cases where respondents glanced at the element but didn’t fixate their eyes on it, the element’s design should be revised in order to make it more appealing to the target audience. This is an example of a gaze plot. The journey from one fixation of eyes (yellow circle) to another one represents the saccadic eye movements. 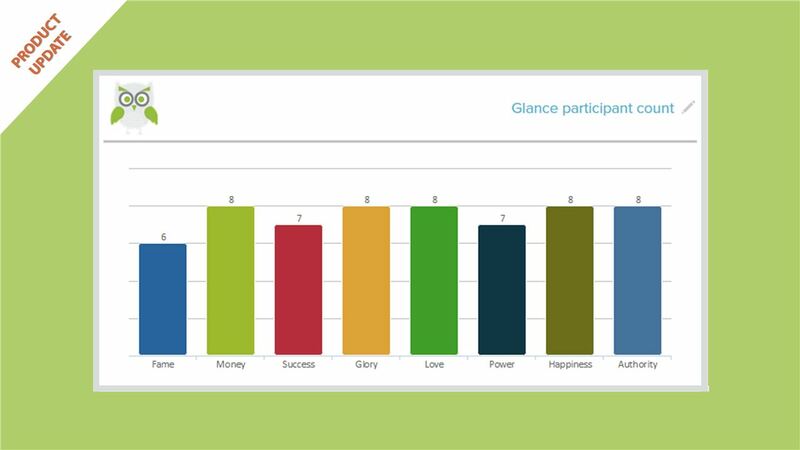 Glance participants count includes both the saccades and fixations and shows things which respondents noticed unconsciously without setting their sight on them. 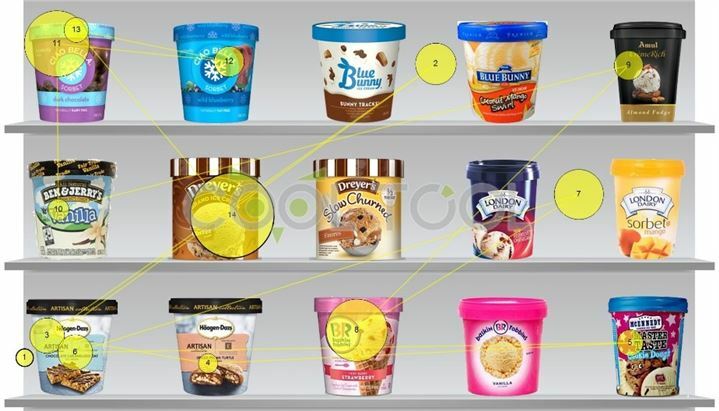 For instance, this example demonstrates that respondents didn’t look where ice cream buckets are placed, but they will be able to tell that they are standing on shelves. Log in to your account to check out new updates or register one at cooltool.com and start your first neuromarketing research project.